The most winningest coach in NCAA Division I basketball history wants to show you how to be a better leader. He's qualified to do that, don't you think? Mike Krzyzewski, or Coach K as he’s more commonly called, is much taller in person than he looks on TV. I guess that’s because the coach of Duke’s multiple champion men’s basketball team and Team USA’s gold medal men’s basketball team wasn’t surrounded by 6-foot-11-inch super athletes at the time I met him in a midtown New York office. 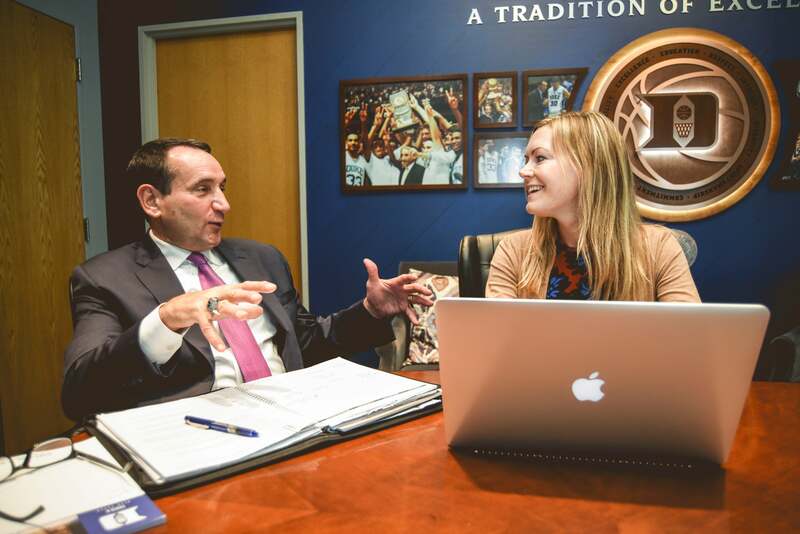 Instead, Coach K was sitting with his business partner Chrissie Gorman, CEO of PowerForward, a new startup digital subscription service that will deliver interactive leadership and team-building videos to users. I had the pleasure of speaking with Gorman and Coach K about their venture and the parallels between leading on the court and in business. I walked out of the room feeling energized, inspired and ready to throw down a vicious dunk on my opponents … if only I could figure out a way to grow a foot and a half on my way to the gym. Last time I saw you, Coach, you had a big hunk of gold around your neck. Coach K: I wish! They don’t give coaches the actual medals, we get replicas -- but that’s OK, the main thing is we won! Coach K: It is a video service a company would subscribe to. People from all walks of life -- sports, business, military -- tell a story about how they have adapted or how they have shown leadership. And as you watch the 20-minute video, the viewer is asked if they would have made the same decisions, if they would have done things differently and why. It is interactive. So you’re not just reading or watching -- you’re able to feel it. And if you feel it, you might own it. And that’s how you get better. How did your partnership come together? Coach K: Chrissie and CAA had the vision to put this startup together, which has been two years in the works. And they were able to help me understand the vision, because this isn’t a world that I am in. Just like she doesn’t understand the vision of attacking a zone or full-court pressing. And now it is a shared vision. I love what she and our team have be able to do. Chrissie Gorman: We had an incredible opportunity to work with a man who has this amazing legacy of leadership. I came in to look at it and see if there was a need we could fill. I looked at the $10 billion B2B leadership market, and we saw a gap in focusing on emerging leaders. Who better to fill that role than Coach K? Your ability to lead spans between athletes fresh out of high school to athletes who are seasoned NBA All-Stars. What are the similarities and differences leading groups like that? Coach K: It is completely different. There’s a big difference in maturity: age, physical and experience. So when I’m coaching the USA team in the Olympics, those guys are professionals, they’ve crossed bridges of experience. The quickest way of explaining it is that we adapt to each other. Then we find the best practices that that group can adapt to. When I’m coaching the young guys in college, they pretty much have to adapt to me. The lessons I’ve learned in adapting to the pro players have been unbelievable. How you train, how they are able to be successful in certain situations -- I’ve learned more in the past 10 years from these guys than I knew before. Coach K: Almost all of them, quite frankly. In some respect, that’s not the world I live in. In college, we have to train our guys. These professionals have their routines. What we do as a group we do as a group. But I have to allow them time to follow the routines that work for them. Demar DeRozan is getting up at 6 a.m. to do his routine, Klay Thompson is going back to the gym and shooting at night. Kyle Lowry is one of the top scorers in the league, and he came to me and said, “What do you need coach? I don’t care how many minutes I play.” It is called selfless. People always ask “How do you get these big egos together?” If you have a good common cause -- to play for your country and win a gold medal -- that’s a pretty good common cause. Like we say in PowerForward, they make a commitment to being part of something that is bigger than you. Coach K: Both! I would say for me, the thought of losing is a bigger motivator than the thought of winning. But the hatred of losing causes you to prepare to win. Everybody wants to win, not everybody wants to prepare to win. You have to love the process of preparing to achieve that goal of winning. People who are less talented can beat you if they are more together, tougher and more unselfish. My kids play little league, and there is a mercy rule that stops better teams from running up the score too high. Are you able to take your foot off the gas during a game? Coach K: I would hope that I am faced with the opportunity in every game that I coach! A lot of people ask if I prefer a close exciting game or a blowout -- as long as we’re the ones blowing out the other team, the sooner the better. Does that competitiveness carry through in business? Do you look to crush your competition? Gorman: In business, you have to be agile. You have to be open to someone coming in and disrupting you. You can’t rest on your laurels. It is always competitive, but in the end, it is all about your investors and your customers. You are working to make their investment of time and money worthwhile, that’s where your focus needs to be. Coach K: I think your focus should always be on yourself, being the best that you can be. Your competition shows your flaws, your weakness. I’m into beating my opponents, not crushing them. Without competition, you don’t know how people are looking to beat you. So you welcome that. To “crush” someone means that you feel like you won. But if you’re committed to excellence, it’s not about one game, you have to be there all the time. You’re never at the end, you’re always "becoming." When you are recruiting new players for Duke, you have statistics that show how talented a player is, but are there any tells that you look for to see if you want them on your team? Coach K: We look for three things: talent, academic ability and character. Are they easy to coach? Is it all about them or is it all about us? We give those equal weight, and if one is missing, we won’t try to recruit that player. Do those three pillars line up with recruiting employees in business? Gorman: Yes, particularly when it come to character. I look for people who say “we” more than “I.” When someone says “we” that means that they feel a part of something being built. Coach K: I ask every kid I’m visiting, “What are your goals?” I visited two this weekend who said, “I want to be part of a national championship team.” And you love to hear an answer like that. If they start asking how many shots they’ll take or minutes they’ll play, that'll all shake itself out -- most likely as you are playing for another team. The “we” concept is huge for us. Gorman: It's funny, as I’m building this team for PowerForward, if someone’s first question is “what will the salary be?” it’s not the right fit. This is a startup, this is about building something together and about the experience. You can go somewhere else if all you’re looking for is a comfortable salary. Part of being a leader is dealing with the good and the bad. The NCAA just announced that they are pulling all championship games from North Carolina due to its controversial transgender bathroom law. How do you feel about that? Coach K: I was asked about this law when we were preparing for the Olympics in Las Vegas. It was a very short answer: It’s embarrassing. And I still feel it is embarrassing because it is discriminatory. I’m all in on what the NCAA has done and I am proud that Duke AD Kevin White has stepped forward on behalf of our university to say that we are against discrimination, and to express our sorrow that it has hurt our great state. You coached all of these guys on Team USA, and now they’re all back in the NBA. So going into this season, who do you want to win? Coach K: First off, I want them all to be healthy. I want them to be taken care of contractually. In 11 years, in the last five competitions we’ve won, we’ve coached 39 NBA players and they’ve all won gold medals. Some multiple times. I have anywhere from 16 to 20 former Duke players in the NBA. I want good things to happen for them all. On Christmas, I’ll be watching the NBA games with my grandsons and I’ll be able to say, "On the court right now, there are six guys I’ve coached." Then the next game will have four or seven. I just want them to do well. And I keep in contact with a lot of them. Relationships are another keyword that we teach in PowerForward. We want people to take these words, make them their own and be better for it.